I have spent many months covering the U.S. Presidential Election with my camera. I started covering 18 Republican candidates and 4 Democratic candidates Spring 2015. In the last 2 days, I photographed Hillary Clinton, Donald Trump and President Obama. There is nothing ordinary about this campaign cycle. Within 24 hours, we will find out who will be the next “leader of free world”. President Obama said during 2014 Democratic National Convention “There is not a liberal America and a conservative America—there is the United States of America. There is not a Black America and a White America and Latino America and Asian America—there's the United States of America.” With hope, may America vote to continue to grow as a united nation. I photographed Hillary Clinton, Bernie Sanders and Donald Trump in NH yesterday and today. Trump in Bedford NH on September 29. 2016. Covered Republican Presidential candidate Donald Trump yesterday in Windhem, NH. February 21, 2015, Freeman Reserved, Todee District Montserrado County, Liberia: Ebola Survivor Mary Kollie at her rented house in Freeman Reserved, Liberia. "I am a permanent citizen of Freeman Reserved, with 4 children. I am living in a rented house. The house owner got sick and died on September 18, 2014 in the house where we lived. The entire members of the house were quarantined at the school building for 21 days. While we were in the school, my daughter Beatrice Beayee, 12 years got sick and was transferred to ELWA ETU and died one week later. My other two children and I got sick and taken to the same ETU. We were admitted for one month and discharged on October 2014. Since my two children and I came back home, my husband abandoned us and I do not know his whereabouts. He was afraid of us and has never come back to see us"
February 21, 2015, Freeman Reserved, Todee District Montserrado County, Liberia: Ebola Survivor Anthony Paye (green shirt) with his surviving children in Freeman Reserved, Liberia. "My story started with son in Law, who was the owner of the medicine store in Freeman Reserved. He treated my neighbor who was very ill and later declared as EVD positive. After the death of my neighbor, my son in-Law began very ill and I started to take care of him in the house without protective gear. He was sick for two weeks and later died en-route to C.H. Rennie Hospital. One week later, my daughter, mother in Law, and father in –Law got ill and they were taken to JFK Hospital, where three of them died. I was also taken to Island Hospital on the 30th of September 2014 and was tested Ebola positive. I was discharged on October 14; 2014. While in the Hospital, my entire house was looted by thieves. They took away the doors and windows from my newly constructed house including our mattresses and clothes. I left my 9 year olds daughter in the hospital and she was discharged on November 3, 2014. She was discharged and turned over to the Ministry of Health. The Ministry referred her to Harbel children care center where she spend months before tracing her family. She was reunified in early February 2015. She has not received her certificate yet. My family and I are presently living in a rented house." February 21, 2015, Freeman Reserved, Todee District Montserrado County, Liberia: Ebola Survivor Saran Dolo in Freeman Reserved, Liberia. "I was living in Monrovia when my husband got sick in Freeman Reserved and joined me in Monrovia. When I saw his condition, I took him back to Freeman Reserved with the understanding that when he died, he would be burned. I later sent for his two brothers from German Camp, Margibi County. My husband died on September 18, 2014. After his death, our family was quarantined for 21 days in the school building in Freeman Reserved. His two brothers from Margibi County got sick and died at an Ebola Treatment Unit. We did not see their bodies. My husband left me with eight children — the youngest is three and the oldest is 21." FACE Africa CEO Saran Kaba Jones carries a Safe Schools Initiative health and hygiene supply as UN helicopter delivers them to its implementation partner, FACE Africa in Neezuin Town, Rivercess, Liberia. The Safe School Initiative being rolled out this month, is funded by USAID (United States Agency for International Development), and coordinated by UNICEF in partnership with the Liberian Ministry of Education and other international and local partners to distribute hygiene kits and implementation of the hygiene kits at every school. The Safe Schools Initiative distributes hygiene kit to 4038 schools in Liberia. Based in U.S. and Monrovial, Liberia, FACE Africa is a implementation partner for Central Rivecess district 1 to distribution Hygiene kit to 26 schools in central Rivercess district 1. . Hygiene Kit includes chlorine, a table spoon (for chlorine measurement), a hands wash bucket with faucet, a bucket, robber gloves, rain boots, cleaning spray tank, stick brooms, hard brush, flip books, cloth, poster for hands wash, 2 thermal guns, manual books and check list for school principal. Liberian Schools have been closed due to the Ebola crisis since July, 2014. Schools are scheduled to open on March 2 in Rivercess. February 19, 2015: West Point, Monrovia, Liberia: A teen activist of A-Life"(Adolescents Leading the Intense Fight against Ebola) on streets of West Point, Monrovia, Liberia. They received training through UNICEF and a local charity "Think" on preventing the spread of Ebola virus. West Point was one of the worst slums in West Africa. Schools in Liberia has started re-opening schools on February 16, after closing schools last July. Due to impact of Ebola crisis on Liberian economy, many youth may not be able to go back to schools. February 26, 2015: Ganba, Liberia: Portrait of a woman community activist in Ganba, Liberia. My Work on Ebola Survivors in Liberia was featured on Public Radio International. To read the testimonials and more photographs of the survivors, please visit PRI the world. July 4, 2015 Gorham NH USA: Hillary Clinton, Presidential candidate and former Secretary of State, marching on Gorham July 4th Parade in Gorham, NH, USA. July 28, 2015 Hopkinton NH USA: Democratic Presidential candidate Hillary Clinton campaigning at Beech Hill Farm in Hopkinton, NH. April 27, 2015: VFW Post 5791, Hudson, NH: Donald Trump potential Republican Presidential candidate, campaigning VFW Post 5791 in Hudson, NH. September 17, 2015 - Rochester, New Hampshire, United States: Republican Presidential candidate Donald Trump campaigning at Rochester Community Center in Rochester, New Hampshire. 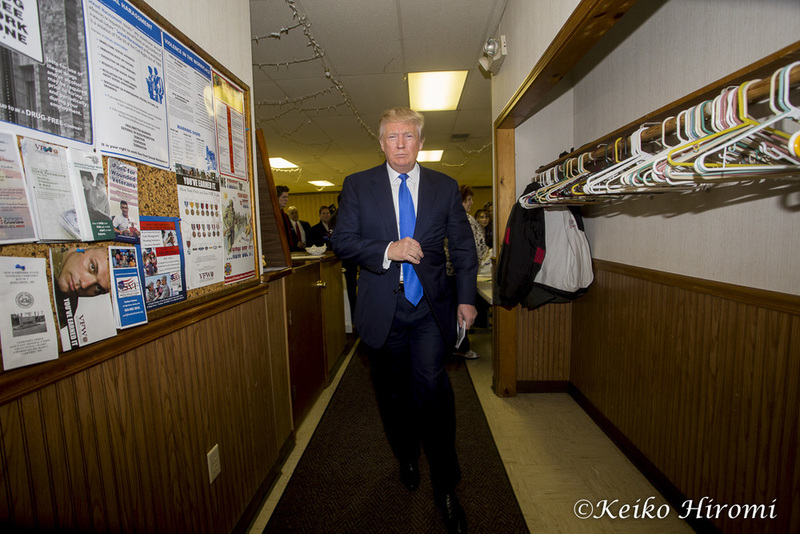 April 27, 2015-Concord, New Hampshire, United States:.Donald Trump leaving "Politics and Pie" at Snowshoe Club. September 7, 2015, Milford, NH, USA: Democratic Presidential candidate Bernie Sanders (I-VT) before Labor Day Parade in Milford, NH. April 18, 2015, Auburn NH, USA: Senator Ted Cruz (R-TX), Republican Presidential Candidate, campaigning with his wife Heidi at the First Assembly God Church in Auburn NH. October 29, 2015: Geno's Chowders & Sandwich Shop, Portsmouth, New Hampshire United States: Republican Presidential candidate Jeb Bush campaigning at Geno's Chowders & Sandwich Shop in Portrsmouth, New Hampshire. July 2, 2015 Nashua, NH USA: New Jersey Governor and Presidential candidate Chris Christie campaigning with his wife Mary Pat Foster at Martha's Exchange in Nashua, NH USA. March 31, 2015: Nashua NH, USA: Former Maryland Governor Martin O'Malley campaigning at New Hampshire Young Democrats social hour at the Margaritas basement lounge in Nashua, NH. July 25, 2015 Warren, NH USA: Republican Presidential candidate Rand Paul (R-KY) campaigning at Moose Scoops Ice Cream in Warren, NH. September 30, 2015 - Durham, New Hampshire, United States: Republican Presidential candidate Dr. Ben Carson leaving after campaigning during a town hall meeting at University of New Hampshire in Durham, New Hampshire. June 17, 2015 Nagasaki, Nagasaki, Japan: Nagaski Atomic Bom survivor Sachiko Matsuo at Yamazato Elementary School in Nagask, Japan. Atomic bomb was dropped in Uragami District in Nagasaki, Japan on August 9, 1945. June 18, 2015 Uragami District, Nagasaki, Nagasaki, Japan: Atomic Bomb survivor Setsuo Uchino outside of now closed air raid shelter in Nagask, Japan. Uchino , 1 year and 9 months old, was inside the shelter, when Atomic bomb was dropped in Uragami District in Nagasaki, Japan on August 9, 1945. Please visit my website to read and learn more about Atomic Bombs Survivors in Japan. May 2016 bring you joy & happiness to your life. I spent photographing Presidential Hopefuls in NH this labor day weekend. On Saturday, I spent covering Hillary Clinton. On Sunday, I spent covering Scott Walker. On Monday, I photographed Bernie Sanders, John Kasick, Carley Fiorina and Lindsey Graham. You can see more photographs on campaign on Road to the White House by Keiko . September 5, 2015, Portsmouth, NH USA: Hillary Clinton Democratic Presidential candidate greets people on streets in Portsmouth, NH. September 6, 2015, Milford, NH, USA: Republican presidential candidate and Wisconsin Gov. Scott Walker campaigning during Labor Day Weekend Harley Ride at Milford, NH. September 7, 2015, Milford, NH, USA: Republican Presidential candidate Lindsey Graham (R-SC) campaigning before Labor Day Parade in Milford, NH. September 7, 2015, Milford, NH, USA: Republican Presidential candidate and Ohio Governor John Kasich campaigning before Labor Day Parade in Milford, NH. September 7, 2015, Milford, NH, USA: Republican Presidential candidate Carly Fiorina campaigning before Labor Day Parade in Milford, NH. September 7, 2015, Concord, NH, USA: Democratic Presidential candidate Bernie Sanders (I-VT) campaigning at his NH campaign headquarter opening in Concord, NH. In New Hampshire, U.S.A., Presidential Hopefuls have begun campaigning. I have photographed 7 (possible) Presidential candidates, since I came back from Liberia at the beginning of March! March 31, 2015 - Nashua, New Hampshire, United States: Former Maryland Governor Martin O'Malley campaigns at New Hampshire Young Democrats social hour at the Margaritas basement lounge. April 6, 2015 - Hollis, New Hampshire, United States: Dr. Ben Carson campaigns at Hollis Pharmacy. Carson is a columnist and retired neurosurgeon redited with being the first surgeon to successfully separate conjoined twins joined at the head. In 2008, he was awarded the Presidential Medal of Freedom by President George W. Bush. After delivering a widely publicized speech at the 2013 National Prayer Breakfast, he became a popular figure in conservative media for his views on social issues and the federal government. He is a presumed Republican presidential candidate in 2016. March 13, 2015: Hudson, New Hampshire USA: Former Florida Governor Jeb Bush attending a house party. Jeb Bush visits New Hampshire this weekend, making his inaugural 2016 trip to the first-in-the-nation primary state ahead his expected presidential campaign. April 8, 2015 - Milford, New Hampshire, United States: Republican Presidential candidate, Senator Rand Paul (R-KY) talks at the historic town hall in the 'Live Free or Die' state. Paul announced his candidacy on April 7 in Kentucky. In recent New Hampshire primary polls, Paul has placed third among likely Republican voters behind former governor Jeb Bush of Florida and Governor Scott Walker of Wisconsin. But on the ground, Paul inherits some of the grassroots network from his father’s past two presidential campaigns, giving him a head start over his rivals. March 12, 2015 - Concord, New Hampshire, United States: Former Texas Governor Rick Perry plays with Chester, Golden retriever at Weed Automotive. Perry has yet to declare his plans for his possible run for President in 2016, but a handful of his former aides and allies launched a super PAC that can raise and spend unlimited amounts of money on his behalf. March 14, 2015 - Concord, New Hampshire USA: Wisconsin Governor Scott Walker visits a grassroots training and rally event at Concord High School in Concord, NH. Governor Walker is on a two day trip to New Hampshire as he eyes a run for president. March 15, 2015 - Barrington, New Hampshire, United States: Senator Ted Cruz, R-Texas, a tea party favorite and presidential candidate in 2016, campaigns at the Strafford County Republican Committee Chili and Chat at Turbocam International. March 13, 2015 - Hudson, New Hampshire, United States: Former Florida Governor Jeb Bush visits Integra Biosciences. Bush was making his inaugural trip to the first-in-the-nation primary state ahead of his expected 2016 presidential campaign.